CBA Finance News | Australian companies are holding more money in liquid cash and deposits than ever before, according to Commonwealth Bank economist James McIntyre, which is both good and bad news for Australian Not for Profits. Australian companies are holding more money in liquid cash and deposits than ever before, according to Commonwealth Bank economist James McIntyre, which is both good and bad news for Australian Not for Profits. Not for Profit organisations have typically held a large proportion of their assets in cash and ABS financial account data released on Friday shows that Australian companies are joining them, holding more money in liquid cash and deposits than ever before. According to James McIntyre, Not for Profits may find all this cash in the economy could be reducing the returns they are receiving on their funds. McIntyre says more assets being held in cash and less lending reduces banks demand for cash – and in turn the interest rate they are willing to pay for cash deposits. However on the positive side, McIntyresays NFPs could target these cashed up companies for donations and goods for their upcoming Christmas appeals. 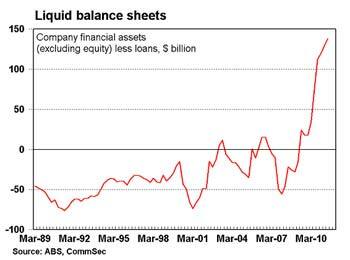 The account data shows that non-financial private sector companies have squirreled away $305 billion in liquid assets with the total proportion of financial assets held in cash and deposits also at record highs. The graph below shows how significant these deposits are. The high level of liquid assets is both a positive and a negative. McIntyre says companies are well able to deal with the challenges posed by the volatile global financial conditions – but at what point does the level of cash become too much? He says it is easy to hold funds in liquid form of cash and deposits, but shareholders also want companies to be exploring opportunities to increase efficiency, productivity or growth organically or by acquisition. According to the financial data it’s not only companies hoarding cash. Australian consumers and superannuation funds are also maintaining extraordinarily high holdings of cash and deposits – with super funds holding almost double the “normal” cash holdings with the proportion of assets sitting just over 15 per cent. McIntyre says Australian consumers could be forgiven for their cash hoarding. The net financial wealth of Australian households (assets less liabilities) fell for the first time in a year, falling by 5.8% in the June quarter. The net household wealth per capita fell from $47,633 to $44,698. Per capita wealth is still up by 1.9% over the past five years and up 19% over the last decade. Currently a big problem is NPOs who do have large reserves, the asset allocations are not prepared by accredited financial planners. Directors are not requesting Statements of Advice, and short medium and long term perspectives. Liability is a reality. Now is a buy market with shares cheap in AAA+ companies, yet Governance rulings applying to most NPOs does not include investment. "Dollar cost application" of capital using managed funds will work over the medium to long term, education in group situations best mechanism. Moderately conservative portfolios would work far better, who would propose idea?